If you do a Google image search for telemedicine, you’ll find images of what most people think of when the term is used, patients in one location using video conferencing to talk to doctors who are located somewhere else. This is an important type of telemedicine, but the term telemedicine encompasses a much broader range of services. 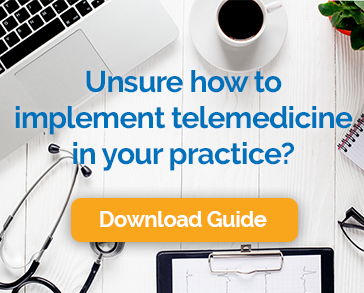 What is telemedicine, you might ask? Here’s a closer look. Sometimes called “asynchronous telemedicine,” store-and-forward solutions enable healthcare providers to share patient medical data such as lab reports, images, videos and other records with a provider at another location. It’s similar to email, but with built-in, advanced security features to ensure patient privacy. This is a convenient way for patients, primary providers and specialists to collaborate because they don’t all have to be looking at the information at the same time. In the same way that you can send an email to a colleague and they can reply at their own convenience, store-and-forward technologies make it easy for multiple parties to work together, even if they are separated by large distances and time zones. Several specialties, including radiology, dermatology and ophthalmology commonly use store-and-forward technologies for treatment and diagnoses. Remote patient monitoring, sometimes called telemonitoring or home telehealth, is a category of telemedicine that lets healthcare professionals track a patient’s vital signs, activities and other data from a distance. This is particularly useful when treating high-risk patients, such as those with cardiovascular problems or those who have recently been released from the hospital. Remote patient monitoring has many practical applications related to the treatment of chronic conditions. Diabetics, for example, can easily transmit their glucose levels to their doctor. Patients in assisted living facilities, or elderly patients at home can be monitored unobtrusively and inexpensively. The video visits we mentioned earlier fall into the category of real-time telemedicine. Patients and providers are connected through audio and video channels for a live interaction. Unlike the other types of telemedicine, which generally supplement in-person care, real-time telehealth offers an alternative to in-person interactions. Just like the store-and-forward technology goes farther to protect patient privacy than traditional email, so too do technologies used for real-time video visits. Consumer grade applications like Skype and Facetime do not meet HIPAA and other regulatory requirements for the transmission of medical data, so dedicated telehealth technologies have been developed to support and secure the practice. All three categories of telemedicine are giving providers more and better ways to deliver efficient and effective care to patients in a way that is more convenient and less expensive than traditional care models. They will be used to help meet the challenges of our evolving healthcare system for many years to come.